March 2015 is the second month of the year of the Yin Wood Goat which began on the 4th February. I would recommend taking a look at the Annual Chinese Animal Predictions and Annual Flying Star Analysis as this will help a lot in 2015 to make the year as successful as it can be. To view one of the articles, click the links below; the page will open in a new window so you wont lose this page. From 6th March to 4th April 2015 is the second month of the Yi Wei year (Yin Wood Goat year) with the ruling energy of #4 in the central grid. North – The energies in this palace possess a sense of new beginnings and many happy events. There is hope for promotion and career change and those in business may also find new ventures in the pipeline. Do make good use of this sector of your office or home. A nice table or standing lamp can be placed here to enhance this wonderful influence. If your work area is in this sector of the office, have a task light on the desk and leave it on whenever possible. Offices or people who work from home with doors opening in the north may find their business goes up a few beats this month. The energies denote great business opportunities so make hay whilst the sun shines. There is no need to enhance the sectors. If you happen to occupy an office in either of these two sectors in your office or at home, stride ahead with your plans and ventures. You can hang a crystal faceted sphere here to enhance if you wish and leave it here for the year. South – This palace houses an auspicious combination of qi for romance so those who are single and are looking for a partner may want to use this sector more frequently. If your bedroom or work area is in this sector of the house or office, rose quartz can be placed here by your bedside or your work table. This can be a good sector for those who are looking to tie the knot or for whom romance is on the agenda. The energy of the month can be conducive for building long term relationships. Southwest – The combination here promotes achievements in endeavours of a studious nature. Those looking to close any negotiations with a successful result will not be disappointed under this influence. Place a nice healthy plant in this sector of the room to promote growth (Please avoid prickly leaves or cactus). Those of you who are Gua 7-6 will do very well if you have spend a lot of time in the SW or if you have door located here. Northeast – Tension, disputes and ill temperaments are indicated causing potential stress and disappointment. Relationships may deteriorate into tiresome battles. Be patient and avoid confrontation is the best cure. Using blue furnishing for the month or display blue ornaments around the room may help calm this fiery interaction. If your kitchen is in this part of the house, be aware of fire hazards and make sure that no fires lit are left unattended. So if you haven’t got a smoke alarm now is a good time to fit one and also check batteries if you have one fitted already. This combination can cause many problems for a business or office environment so please be careful and try and place some blue items on your work desks if your office is in this area. Do not get drawn into any heated disagreement. What needs to be said can be said when tempers have cooled. Red colours or any ornamental objects that are sharp or triangular in shape are best avoided in this palace. Northwest – This is where the monthly #5 Yellow resides so please be very careful with noisy renovations, banging, drilling and hammering in this part of the house. Those who are recuperating from health, try to stay away from this palace especially women. You can place some metal objects in the northwest corner of the room to dissipate the malevolent influence of the monthly #5 Yellow. Business with a main door in this palace should not take unnecessary risks this month as the chance of financial loss is higher. There is not much headway this month so, don’t waste time. Use your energy in a more effective way by planning for the month ahead instead. Southeast – Anyone under this influence may find themselves involved in office politics or in situations where they have to handle or deal with unpleasant disputes or they may experience difficulties handling their superiors, peers or people under their care. All these may cause stress affecting their health and state of mind. Legal complications may arise at work for some. A word of caution for those of you in the hotter parts of the world, do not place your fan in this corner of the room. If you cannot avoid this sector, try to stay low and keep your head together and let the monthly influence pass with you unscratched. 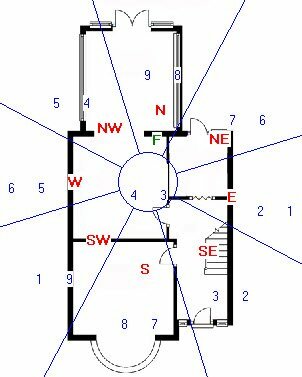 If there are external poison arrows, for example, sharp roof lines, sharp images or unfriendly structures pointing at your property from this southeast direction, place a Ba Gua outside. East – The influence this month causes possible marriage problems and danger of miscarriage if not careful. For those whose bedroom is in the east palace of the home and whose work requires much travelling, do take extra care and patience on the road. Plants can be placed in this corner of the living room for the month. West – Stressful working conditions may affect health with headaches or migraines. Take time away from the computer screen during the day to rest your eyes and drink lots of water. This is especially so if noisy renovation or maintenance work is conducted in the west part of the office or home. Avoid disturbing the west during the month. Keep the area as quiet as possible. You can place a Wu Lou along with six Chinese coins tied in a row with red ribbon in the west, this will weaken the negative earth element.